That Saturday the 17th was like any other normal day, expect that we had two events, one of which we would be hosting. We woke up early for a fun focus group that involved Johnson & Johnson. Valentina got to go with me, she was fine during the entire focus group. No pain, no complains. She made new friends and got to play with some old friends. After our focus group it was time to take the bus back home so we could get ready for our #JustAPajamaParty Event. That meant running around to quickly grab a bite to eat, going home picking up bags that i'd already made sure to pack up, take a cab to downtown Manhattan where we would meet up with Melissa & Misa (JustABxMom a.k.a my business partner) We got to the hotel got settled in, which meant the girls jumping up and down on the bed, the usual hotel tradition and after making sure we were ready for our guests, off we went take a quick tour and grab a bite to eat, still no sign of distress with Valentina. It was 5:45pm when our first guests started to arrive and when the pajama party was about to get started. The surprise princess arrived at around 5:50pm and that's when the first sign that something was wrong began. Valentina told me that her stomach was hurting, I asked her if it hurt really bad and she said no, it was just a little stomach ache. She hadn't really eaten anything and my guess was it was probably the candy she'd eaten. Off she went to continue to play. As the minutes passed she started looking a little bit tired and sad but just a little bit and said that her stomach still hurt. I touched her stomach to see where exactly it hurt and when I touched, she would say yes, it hurts there around my belly button. My next instruction was to make sure that she drank water and stayed hydrated. Which she did, I noticed that she'd take sips when she had some discomfort. As the time passed which was maybe another hour she told me that she was sleepy and her stomach was still hurting. We were in a hotel room, so I made sure that she laid down to relax and take a nap, maybe the pain would go away. Everyone went down to eat pizza and she refused going to the lobby, when we were alone I asked if maybe she had to do number #2. It would help with any pressure she was feeling. Well, after taking her to the bathroom and making number #2 she looked a little bit better, so much so that she decided to join the other girls in the lobby and eat some pizza. She was able to pick at the cheese from the pizza before laying down again on the couch this time. My gut instinct started to tell me that something was wrong, especially when she wanted to sit by herself and not her friends. It was time to go back to the room for games and un-boxings. Valentina ended up falling asleep again, this time I knew that when she woke up we would be heading home and leaving early. Each time she woke up her attitude and reaction was different. It was 8:00pm when she fell asleep. The first time she woke up she cried that her stomach hurt and when I told her we would leave, she ended up crying that no, she wanted to stay. The second time she woke up she cried that there was sharp pain and she curled up into a little ball. By this time I was already texting my mom that I would be heading home early because Valentinas stomach was hurting. My dilemma was that she was sleeping and I didn't want to wake her up. By this time I was really worried, watching her sleep and curled into a little ball while her friends laughed and played broke me and ended with me having a mini meltdown while she slept. Which in my opinion was what helped keep me stay tough during the next few hours of what would be the longest night ever. My friend Shirley assured me that she would be ok and that her stomach pain would go away but in my gut I knew that it was more than just a stomach ache. It was now 9:55pm, time to leave and wake her up to go home. At this point baby girl was screaming, she said that there was stabbing pain, she couldn't walk or stand up straight without screaming in pain or crying. I ended up carrying her all the way to the lobby where we took a cab straight to the ER. It was now baby girl with me in the cab and as I watched her in the little corner of the cab, I made sure to put on my tough mask on. I swear that the cab driver took the longest route possible and what should have been a 15 minute ride ended up being a 35 minute ride, enough time to text my mom and husband that we were on our way to the hospital. My exact words "I'm headed to the hospital because baby girl has sharp pain in her stomach and can't walk" husband immediately left work and took a cab to meet us at the hospital. My mom started praying but still had no clue to the seriousness, they'd seen her a few hours ago. Smiling and jumping around in the living room. By the time we arrived at the hospital Valentina was dazed, I had to carry her in to the pediatric ward. She was pale, shaking uncontrollably, and starting to feel warm. She wouldn't let the doctor touch or get near her belly. They immediately gave us a room in the ER and set her up to get an IV. It was 11:30pm when she was with the IV. The pain was still there but she would go to sleep and wake up. it was time for testing. The first one would be an ultrasound. Babygirl kept scrunching up her face as they pushed into her stomach and side but she was so brave, holding on to my hand. The technician asked us if she was having constipation problems, and she had for a few days now, he then proceeded to tell us that she was full of poop. I remember somewhere reading that when that happens you can have real bad stomach pain that gets confused with appendicitis. We let out a sigh of relief ok, so she has a lot of poop, what next. Oh. some medicine to help with the constipation and then maybe go home. Wow, ok thats great news. What wasn't great was watching Valentina start shaking like she was having convulsions. After calling the doctor and having them check her temperature, they saw that her fever was up. It was now 104, you could see the worry in his face and that meant that it wasn't poop and my gut instinct started again, reminding me to always follow what you feel and even though I didn't want to admit it. Something was wrong with baby girl. It was now sometime after 2:00am and she would go for an x-ray. The x-ray would be able to give more answers. The x-ray was done and babygirl fell asleep. She was now on iv number #2 and still looking bad. She would fall asleep and wake up crying in pain, she would talk about birds or weird stuff that she was seeing. That worried me and made me nervous but back to sleep she would go. I truly believe with all my heart that her little guardian angels were watching over her and making her sleep to make the pain more bearable because each time that she woke up she'd cry and scream in pain. So how she slept through that pain for so many hours is a mystery but one that I'm truly grateful for. We had doctors come visit us and keep asking us the same questions, "When did the pain start"? "What was the last thing she ate?" "Any change in routine"? and still no answers, nothing. Now we had another doctor come in and say that they would take some blood and she'd have to go for an MRI, that would define what she had or what they suspected might be wrong. Appendicitis was a possibility but what kept leading them off was when they'd ask her to move her legs up and down she would move them fine, her knee would touch her chest and nothing. no wince. But to be honest, they would always check when she was having a few minutes of sanity with no pain and just numbness. It was 4am and her fever was going up again, now it was time to get her to do the MRI. Even grown adults freak out and don't end up staying in the machine. Valentina would have to stay inside of it for 45 minutes. She was given something through her iv to help real her a little bit, but it wasn't a promise because some kids burn it off fast. Who knew how her body would take it. As we headed to the MRI station she was sleeping, she'd been told what would happen a few minutes ago. That she'd go in the machine and hear a lot of noise, that she wouldn't feel any pain but had to make sure to stay still. The technician wanted to take her in by himself and he would come out if she woke up, nope sorry. Would not happen, if she woke up and I was nowhere in sight, baby girl would freak out and she did not need that on top of what she was already going through. This momma would be going in as well and make sure that if her baby woke up, her momma was right there with her. 10 minutes into the MRI, Valentina woke up crying. I was told by the technician to press the button only if she started sitting up and screaming. She started crying and shaking her head a little but I was so freaked out that I did the first thing he told me not to do. press the button. Good thing, he didn't stop the machine and just asked through speaker if she was ok. Thumb up, yes continue with test. I reassured Valentina that I was right there with her, with one hand cradling her side cheek and one hand on top of the button just in case. The 45 minutes were up and baby girl did amazing, she stayed still for them to take the images that they needed. It amazes me how she was able to stand the noise, they did put ear plugs and some pillow to put pressure, but with me on the outside and wearing ear plugs I could still hear how loud the machine was and came out with a headache. I'm telling you that she was completely out of it. By this time it was already 5:42am and we were back in the room at the ER. Valentinas fever went up again and it was time for another dose of Tylenol and yet another iv. Another hour went by and at around 6:40 am the radiologist that was on call came in to tell us that we had to wait until around 8:00am when the head pediatric radiologist would come in to speak with us. The MRI test was still unclear, after 3 tests and they still didn't know what was wrong. The only thing they knew was that her fever kept coming back and her white blood cells were elevated, meaning that something was wrong and definitely going on. Another waiting game but this time husband broke, what put him over the edge was Valentina waking up and sitting up talking about rainbows. She kept pointing up and to the right side and saying that the rainbows were beautiful and that she could touch them. Humberto started crying and I could have hit him right there, how dare he cry in front of Valentina. She had to see us strong, not worried because if she saw us crying then she would worry and be scared. I made him go out the room until he was fine. By this time my dad had come over to the hospital to join us and see baby girl. So much support and strength and yet I felt so lost, sad and mad. How could this be happening, just yesterday morning Valentina was jumping and playing around and now she was laying in a hospital bed and with no answers as to why she was there and what was happening to her. I felt helpless, why couldn't I be the one to feel the pain? Why wasn't I the one in that hospital bed? She looked so tiny and pale, as if she'd shrunk in a matter of hours. I wanted to scream, to runaway because I still couldn't believe what was happening. But instead this momma put on her brave face mask on and I made sure to smile, yes I smiled every time Valentina had a sharp pain and screamed out I held her hand and smiled at her, reassuring her that it would go away, that she would be better in no time. That the doctors and everyone at the hospital were trying their best to make her feel better. Every time a doctor came in, she got worried that they'd give her a shot or more medicine and again I reassured her that everything would be ok. It was now 10:00am and a surgeon came in to touch her belly, he lifted her leg and nothing she was fine but they still weren't convinced because the moment he put her leg down she screamed in pain. We were told that the surgeons and other doctors were in a meeting talking about what would happen, comparing the images from the first ultrasound, x-ray and MRI, that meant more waiting. He left and a few minutes later the nurse came in and said that another ultrasound was needed. Half an hour later and off again we went to get another sonogram. This time it was really painful for Valentina, yet she didn't scream or cry. She would scrunch up her face and hold her breath. That lasted about 30 minutes. At 12:15pm my sister and brother in law arrived, Valentinas little face lit up just a little bit as she saw some of her tia. More waiting and more waiting, it was around 1:20pm when two surgeons came to talk to us. 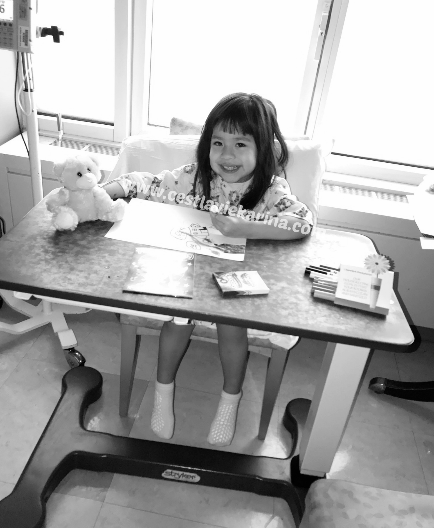 Valentina was awake and sitting up, she was able to listen and as they spoke I could see the waves of fear go over her. They didn't know what was going on, the ultrasounds and MRI showed the appendix at normal size, it wasn't big like when you are having an appendicitis attack. They wanted to take her up for surgery, if it wasn't appendicitis they would explore and try to find out what was going on, the reason for emergency surgery. 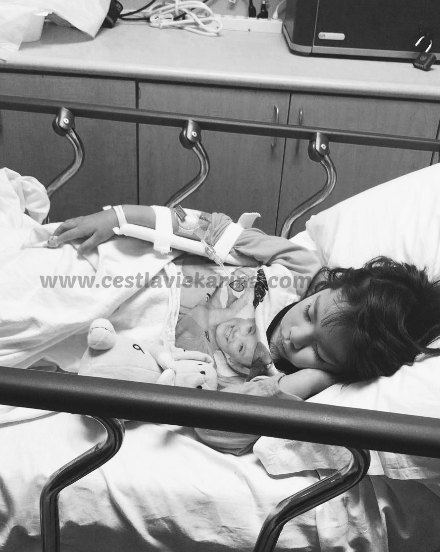 Valentina couldn't walk, she was in horrible pain, had a high fever and shaking uncontrollably. My reply "When would the surgery take place?" Surgeons reply "In a few minutes". That's why they were dressed already, I wanted to disappear, the earth to swallow me whole. My head turned to my husband, to my dad and finally to the surgeons, where I could feel myself saying ok and then making sure to look at Valentina so I could smile and reassure her that everything would be ok and that surgery was nothing to worry about. My legs were jelly as we walked up to the operation room. Miguel and my mom were on their way, they wouldn't be able to see baby girl before she went into surgery. 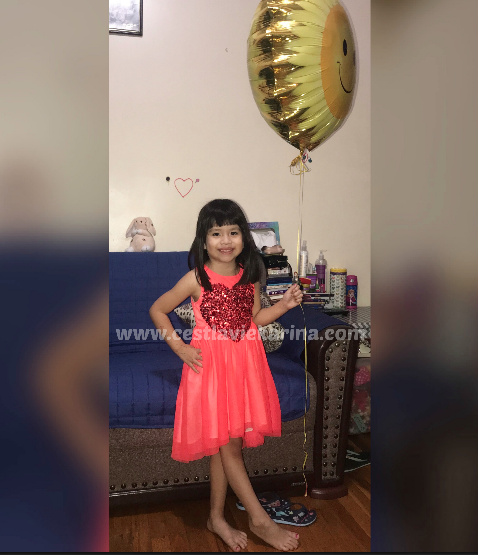 Also because like with any surgery there might be complications and in Valentinas case she had a higher risk of having problems with the anesthesia, due to her congestion in her nose and chest. Humberto and I got suited up in scrubs, all while looking at my baby and smiling at her. I'd stop and squeeze her little hand every few seconds. She was wearing a little hat and holding on tight to her little bunny. "It's ok, mami. 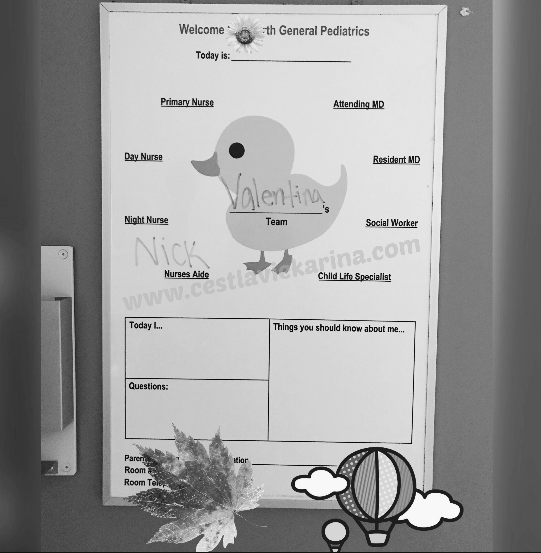 The doctors are just going to check and see what's wrong with you and help you feel better in no time" were my words to Valentina as we walked down the hallway and into the operation room. It was time to give her the anesthesia, she was fine because she didn't know that she was going to be put to sleep, that was until the anesthesiologist said "ok, now we are going to put you to sleep". Why would he say it out loud! Valentina started crying and freaking out, I had to tell her that it was just water they were putting in her iv. She relaxed a little and I kissed her and just like that she started closing her eyes and before I knew it, Valentina was asleep. Humberto kissed her on her cheek, grabbed her bunny from her arms and out the room we walked. As we walked out and the nurse walked us to the waiting room, the tears started coming down. The nurse reassured us that she would be ok, as she walked away and my sister started walking towards me I could feel something start to curl up in my throat and by the time my sister hugged me, the wailing started coming out. The surgery would take about 2 hours and it was already 2:00pm. My baby wasn't watching me, I could cry and wail. There in the waiting room my dad and mom took time to hug us and each time i'd cry and wail, by the time Miguel was in my arms and crying as well, my chest started to tighten up, an anxiety attack was about to happen. After crying and letting it all out of my system it was time to pray and wait. We made sure to drink a coffee and eat something quickly, we had to be strong for when Valentina woke up. At 4:20pm the surgeon came out to tell us that baby girl had come out from surgery. It was appendicitis, if they hand't done the surgery her appendix would have burst within a few hours and that would have been worse and life threatening, everything went great during the surgery. The thing was after, she was having problems with her breathing and therefore needed a breathing mask to stabilize her breathing. Walking to the recovery room, I could have run and walking fast as I did, still felt like I was walking in slow motion. She looked so tiny in the bed, with the huge gown that they out on and with her gasping for air. Valentina is already pale and to say that she was even more pale is just scary. Waking up from anesthesia took a while, we started to get scared but for the same reason that she was having problems with her breathing, waking up from the anesthesia took longer. When she finally woke up she was so happy to see her Abuelita, brother and uncle there. I was just relieved with seeing her little face again and her not looking dazed or feeling pain, aside from the pain she had from surgery. Depending on how the night went and the next day we would either be released that Monday the 19th or Tuesday the 20th. That night she was able get to of bed and walk to the bathroom. I truly believe that it was due to the morphine and anesthesia still in her system. The doctors and nurse checked in on her every 4 hours. No fever, she was doing good. The next day she woke up sad and not wanting to get out of bed to walk, that lasted about 5 hours. If she wanted to go home she would have to get out of bed and drink and eat solid foods. At 3:30pm we were given the all clear to go home. By 7:15pm we were home and surrounded by family. It is still so surreal to me everything that happened that weekend. Today marks two weeks that it happened. As I finish this post up and look at the time, I think back to two weeks ago. When we were in the hospital waiting to get the ER. It's been rough watching Valentinas recovery because I feel guilty, was there something that I could have done to prevent it? Did I overdue it with her by taking her to activities and then events without giving her body a break? Should I have taken her to the hospital sooner? and every time I look at a picture of that night and the pajama party, I'm remembered of why Valentina is our rainbow baby. She's been so brave and strong since day one. I'm making sure to watch her as she recovers.and even though we've had a scare here or there, Valentina keeps on being the brave little girl that she is. Oh, and I've also promised myself to not ver due it with her. As we get ready to say goodbye to this 2018, I feel relieved and can't wait to kick this year adios but at the same time I embrace it because it was a blessed one. Full of learning moments, growing moments, and most important it reminded me just how important it is to live in the moment and enjoy the time that you have with your loved ones. Anything can change in a matter of seconds or minutes. I pray that this was out first and last time to see one of our children or loved one in the hospital and in a situation like this. Thank you so much to all the love that was received and prayers. I am especially thankful for my family who was there with me from the moment they found out what was going on Valentina. To my business partner who made sure I was ok and made sure to ask is she was needed at the hospital and offered to help in any way possible. It's like my dad always say's, it's during those most crisis moments that you know who is who, and who is truly there for you. Now to get ready to send Valentina to school this Monday, December 3rd. She was good to go last week but we made sure to keep her home until she could do everything by herself again, except gym and her ballet. That she has to wait until the new year at least. 1 comment on "A Parents Worst Nightmare Come True - The Day Valentina Had Emergency Surgery"
My heart goes out to you Karina! I can only imagine how you and your must have felt. Thanks goodness your little angel is well and you served as such a shining example of strength. Hugs to you and your family.